Our infant program provides a nurturing, supportive, and secure environment designed to become the building blocks for successful, life long learning. The attentive and responsive care given daily will enable the caregivers to build upon the child's strength's, needs and interests. Our rich sensory filled curriculum encourages the child to actively explore their world and gain confidence in themselves as successful learners. Mobile infants are active, enthusiastic explorers who are in love with the world. Our caregivers provide a nurturing, safe environment that promotes an atmosphere of exploration, discovery, and challenges. They enjoy watching and imitating each other as they respond to new situations and people. Creative, hands on activities and a sensory rich curriculum will excite and motivate your child. This will give them the comfort and confidence to speak those first few words, walk those first steps, and make new friends. 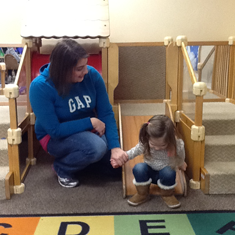 Toddlers busily explore their happy environment while gaining their independence. Responsive and caring teachers understand that toddlers want to practice their new skills, make their own decisions, and do things themselves. 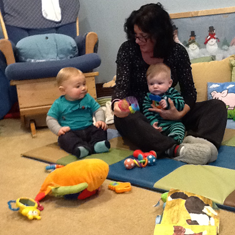 Problem solving, concept formation, cooperation, and self help skills are emphasized in our toddler curriculum. Well planned learning centers offer predictable routines, small groups, child choices, self directed play, and supportive teaching that prepares the child for academic achievement. Our preschool program is an exciting, learning environment designed to nurture the total development of a young child. 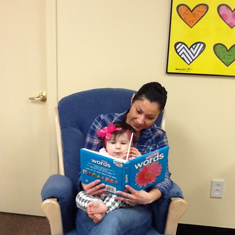 Our teachers implement a preschool curriculum guided by the Rhode Island Early Learning Standards that include theme related materials relevant to the child's interests, learning style, and developmental level. Learning Centers are clearly defined areas that provide play and learning opportunities to support each child's growth towards the Standards. Through these Learning Centers teachers offer many choices to develop the child's self confidence and decision-making skills. Fours are a wonderful mix of independence and sociability. Our pre-k program is designed to prepare your child for Kindergarten in academic, social, emotional, and physical skills, while promoting a love of learning. This program introduces children to a wide range of academic topics and learning tools through a theme based curriculum and child engaged learning centers. Through play the teachers help the child develop skills in self regulation, self realization, and independent thought and expression. The Rhode Island Early Standards and their eight domains are incorporated into our curriculum. Our Kindergarten program was established in the year 2000 to provide a clear expectation of a child's readiness to attend primary grades. This is achieved through a creative, stimulating program, in a relaxed secure environment. Licensed by the Rhode Island Department of Education, our classroom consists of no more than 12 children and combines high quality, structured education with individual attention in a full day setting. We offer optional before and after school care licensed through the Department of Children, Youth, and Families.